Run or Walk with us in our beautiful City of Lakes. 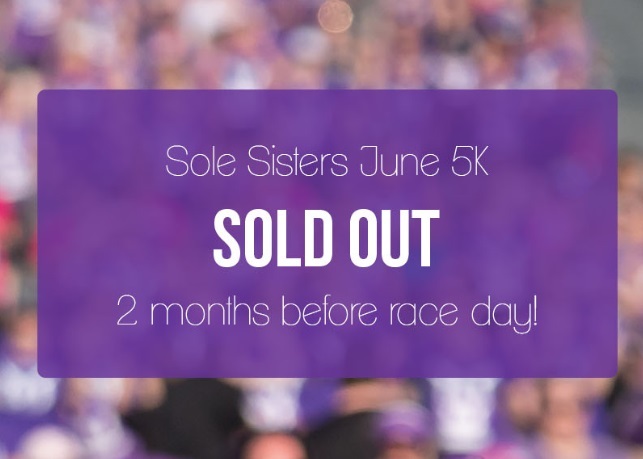 Sole Sisters is an un-timed 5K that you can run or walk. We welcome newbies and veterans alike! There is a HUG station, chocolate station, cheer/water stops, music on course and fire fighters waiting with the prettiest finisher’s medal you’ll ever get. And new for 2018, every participant will receive a race wrap buff featuring the Sole Sisters Tartan in their race kit! Celebrate with us at our 7th annual women's only 5K that is a fundraiser for Girls Gone Gazelle Run Club (an empowering and free program for girls 8-13 that we'd love to invite your Gazelle to join, check out www.girlsgonegazelle.com). While Girls Gone Gazelle is our primary focus we also donate $5,000-$10,000 to other amazing and important local charities. We started this event to fundraise for the Gazelles to keep the best curriculim we know of free but we quicly learned there are other not for profits that could benefit too! Curious to see what the race swag looks like? You can find it on our website www.solesistersrace.com. And if you have ever wondered why we include tutus in the premium race registration read this. As this is a fundraiser for Girls Gone Gazelle Run Club there simply are no refunds. No exceptions. However, you have options if you descover you can't join us after registering. (2) You can transfer or sell your entry up until May 17th at 11:59pm. Keep in mind that you are responsible to find your replacement, collect your payment the fee to transfer is $1.95. Changes to previously selected sizes may or may not be allowed depending on time of transfer. All purchased merchandise will be available at the race kit pick up, not mailed with one exception. The only item to be mailed is the SECOND Tartan Race Wrap if purchased. Sole Sisters Women's Race Series has the mission "to postively influence the mental and physical health of women and girls through physical activity." Sole Sisters funds the FREE confidence club: Girls Gone Gazelle Run Club which has the motto: "I don't chase boys, I pass them!" and looks to promote confidence and body acceptance while building a girl's knowledge of excercise. If this is something that you would like to support further by partnering with Sole Sisters Women's Race Series as a sponsor, contact Stacy Chesnutt directly at stacy@solesistersrace.com.